This week on the 1 TIX Commander Challenge, I’m bringing my budget Daxos of Meletis to face off against Card Knock Life‘s Corey Murphy, returning with his Oona, Queen of the Fae deck. Let’s not beat around the bush—Oona kind of destroyed Nekusar last week. I’m here to seek my revenge, and I’m only going to spend $1.00 on Magic: the Gathering Online to get it! Now that I’ve played a few matches and spent a considerable amount of time brewing these single ticket budget Commander decks, I’ve gotten a much better feel for what’s possible in the format. While there can be a significant difference between MTGO and paper Magic prices, these builds can still be a great starting point for anyone looking to brew on a budget. The secret to making a low-cost Commander work is to really focus in on a strategy or theme. Many powerful cards are normally considered “auto includes” in EDH, but they each take a valuable slot in the deck. This may give you an opportunity to fit in more cards that synergize with your desired strategy. In this 1 TIX budget Commander build, I take Daxos’ conditional evasion as a starting point and run with it. The plan is simple: outrace my opponent with a bevy of creatures are almost literally unstoppable without hard removal. Read on for my full list and deck tech (or watch the embedded video deck tech on YouTube). NOTE: Since we’re dealing with a large number of cards at 0.01 and 0.02 TIX that vary in price over time, this list may be slightly over or under 1 TIX when you check out. All 1 TIX Commander decks are 1 TIX or under when purchased for The Discard. Sometimes, the best commander is a creature that informs the way a deck is built—and would be welcome on the battlefield—but isn’t necessary to win. That’s the case with Daxos of Meletis. Much of the time, we will only want to cast him when he is better than the options in hand, or when it is very likely that we can successfully utilize his triggered ability. As a 3-mana 2/2, Daxos can come down early, but we really only care about him when we can reasonably get through, gaining some life and temporary card advantage off the top of our opponent’s library. Almost without exception, our opponent will have little to no hope of ever stopping us with anything short of creature removal. The name of the game is inevitability through unblockability. This creature can’t be blocked. 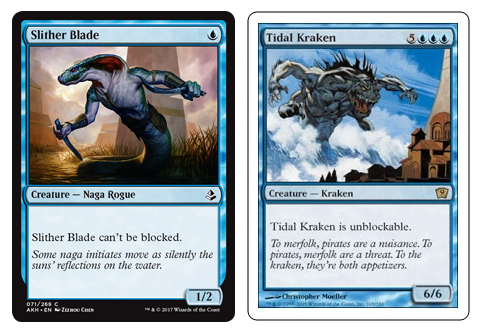 From the mighty Slither Blade to the majestic Tidal Kraken, the most obvious start for a deck like this is to run creatures that are straight up unblockable. I have long wanted to build a deck that takes advantage of unblockable creatures, and with a laser-sharp focus on that theme, we will happily pay the premium these creatures often fetch. This is the most straightforward category of creature in our deck, so we’ll leave it at that. While unblockable creatures have been around for quite a while in limited quantities, Shadow is where we start really digging into Magic’s past. The Shadow keyword ability comes all the way from the Tempest block released in 1997, and it’s reminder text reads, “This creature can block or be blocked only by creatures with shadow.” Shadow later returned in Time Spiral. In a way, Shadow creatures live in their own dimension, separate from normal creatures. This represents the subset of races trapped in the space between the merging planes of Dominaria and Rath. Shadow creatures are primarily white, blue and black, which gives us a number to choose from for our deck. Two of our best creatures have Shadow. Soltari Champion grants all of our other creatures +1/+1 until end of turn when it attacks, rewarding us for going wide with creatures that will rarely die in combat. 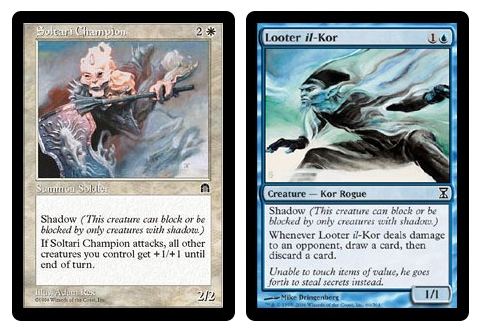 Looter il-Kor provides a small amount of early pressure that more importantly can consistently cycle through dead cards. This deck is careful not to run too many creatures with Shadow, however. Since they cannot block or be blocked except by other creatures with Shadow, they could become a liability. If all of our creatures had Shadow, we would essentially make our opponent’s creatures unblockable as well. Finally, we have one of my all-time favorite keywords in Magic: the Gathering. Horsemanship’s reminder text reads, “This creature can’t be blocked except by creatures with horsemanship.” If that sounds familiar, that’s because it is essentially the Portal Three Kingdoms version of Flying. While there is a small chance your opponent may play one of a handful of Shadow creatures (most likely Looter il-Kor), there is very little chance they will be playing creatures with Horsemanship. If you’re unfamiliar with Portal Three Kingdoms, it was a beginner-focused set released primarily in Asian countries, with only a small English printing that was never sold in North America. This set retold elements of Chinese history with illustrations by Chinese artists, in an effort to introduce new players to the game in a familiar way. 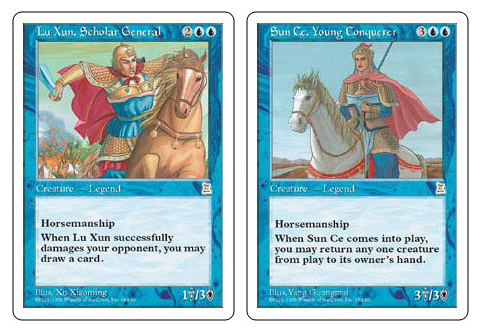 With such a limited release, Horsemanship appears on only 36 cards, all of which are exclusive to Portal Three Kingdoms. For us, they are additional unblockable creatures. Thankfully, their price on MTGO is significantly less than in paper Magic, so 1 TIX Commander is a great opportunity to play with some interesting cards from Magic’s past that are otherwise largely inaccessible. How often do you get to say things like, “I cast Lu Xun, Scholar General,” or “I’ll declare attackers with Sun Ce, Young Conquerer.”? Not often enough! I’ve touched on the elephant in the room a few times here: these creatures are often kind of shrimpy. We’re playing a creature heavy deck that aims to get in there turn after turn, but only getting a single power for one, two or even three mana may not get us there. For that reason, we’re running a suite of anthem effects and other cards that help close out the game. Glorious Anthem and Always Watching provide much needed early-game upgrades for our unblockables. They’re joined later by creatures like Thisledown Liege and Kongming, “Sleeping Dragon”. Now what? The board is covered in critters that come and go as they please, but we haven’t closed the game yet. There are a lot of interesting things we can do with these creatures. (I think some of the Shadow-based utility pieces like Soltari Visionary and Thalakos Deceiver deserve to see more play outside of a silly deck like this.) But our primary goal is ending the game as soon as possible, before too many Wrath effects can set us back beyond recovery. 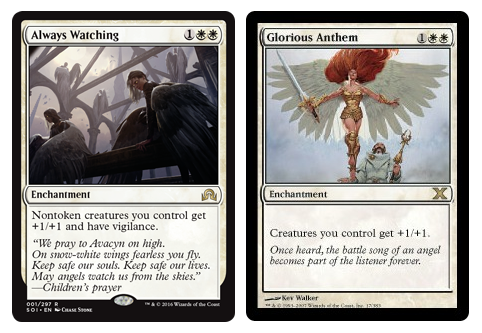 In the late game, we hope to drop Angelic Skirmisher or True Conviction to give our creatures lifelink. If that happens, the gap between our life total and our opponent’s will hopefully grow fast enough that they can never catch up. Similarly, Bident of Thassa can absolutely bury the opposing player in card advantage. These cards are “balanced” by the fact that combat is typically a risk/reward calculation, but our creatures just do not care about what they’re running past every turn. Let’s talk about two pieces of equipment, which I feel may be among the very best tools in the deck. The first is Strata Scythe, which allows you to Imprint a land from your library and give the equipped creature +1/+1 for each land on the battlefield with the same name. With our strict budget, this deck only runs basic Islands and Plains. If our opponent has either of those in play, even better! It may not seem like it on paper, but Scythe-up someone with Horsemanship, and your opponent needs to answer it as soon as possible. The second equipment card feels a bit like cheating, if I’m honest. Grafted Exoskeleton is likely the fastest way to end the game. Not only does it cut our opponent’s life total down to a virtual 10, but it allows for recovery from a board wipe with only a single creature. This deck is about inevitability, and the Exoskeleton does a good job of that. 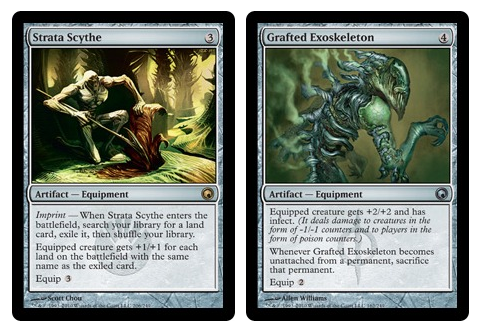 Coupled with our anthem effects, Strata Scythe or even Loxodon Warhammer, Grafted Exoskeleton is the single most important threat for the opposing player to answer. 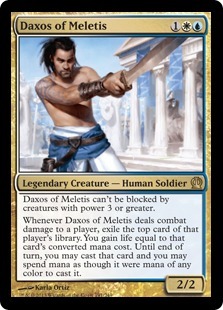 I have not spoken much about the spell package that accompanies Daxos of Meletis on his unstoppable journey, because it mostly consists of predictable pieces: card draw and removal. However, I would be remiss not to mention one additional option for closing the game that comes in the form of Charge Across the Araba. 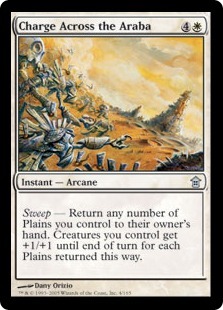 This 5-mana Arcane instant asks you to “Sweep” any number of Plains you control to hand, and in exchange, your creatures get +1/+1 until end of turn for each Plains returned this way. With 4-6 unblockable creatures against a tapped out opponent, the Charge will provide opportunities to win “out of nowhere.” This is another example of our budget manabase helping us end the game faster. As a player of 20-some-odd years who grew up admiring these strange cards and mechanics, I have wanted to make a deck like this in Commander for some time. The 1 TIX Commander Challenge presented the perfect opportunity. What do you think? Is there anything I missed? What budget Commander decks would you like to see us test next? Let us know either here, on Twitter or the comments on YouTube.